Shacknews continues to stay on top of the newest Hearthstone Grand Tournament expansion cards being revealed by Blizzard each day. With new cards being unveiled each day, we continue our ongoing quest to stay on top of each one of them. Let's continue. On paper, this doesn't sound like such a great play. 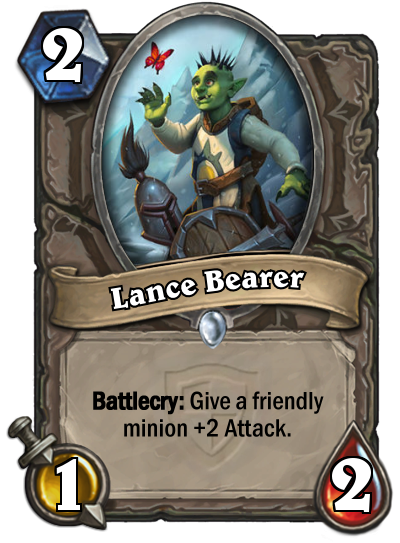 Lance Bearer looks like a more expensive Abusive Sergeant. But think a little harder. His main advantage is that the attack boost given to another minion is permanent. So which minions could benefit from this? The answer, of course, is any Divine Shield minion. Argent Squire and Annoy-o-Tron should immediately come to mind, freeing them up for a chance to take out an opposing minion with a little extra punch. Zoo decks packing Divine Shield minions should give Lance Bearer a look, but any other decks that specialize in Charge minions may want to stick with Abusive Sergeant, instead. Coins for everyone! Well, alright, just coins for you. Cutpurse's main function will be aiming for the face and helping earn as many coins as possible in his short, short life on the board. Rogues should do their best to get Curpurse on the board as soon as there's a good opportunity to keep him hidden. This means using Conceal at the right opportunity. 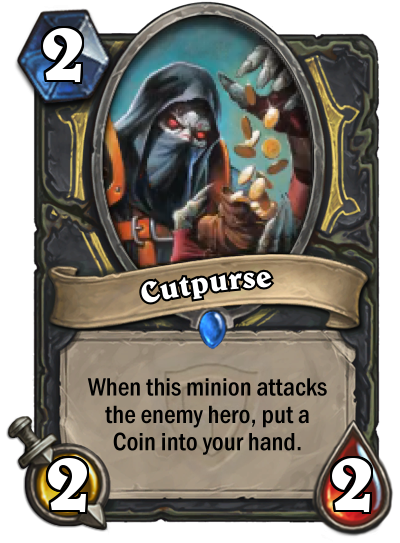 Coins are precious commodities to Rogues, since they'll help trigger a lot of combo plays. Look for Cutpurse to find a home in number of Oil Rogue decks looking to trigger the additional Tinker's Sharpwood Oil effect. If Stealth isn't possible, there's always the opportunity for a Turn 1 play by playing the second turn Coin. If an opponent has no immediate answer, there's a good chance to sneak in a face shot and come away with a Coin before playing Conceal to get another one on the next turn. Eesh! The Warlock already has enough minions that are as annoying as mosquitoes and here comes another one. But this one has a lot more drawbacks. 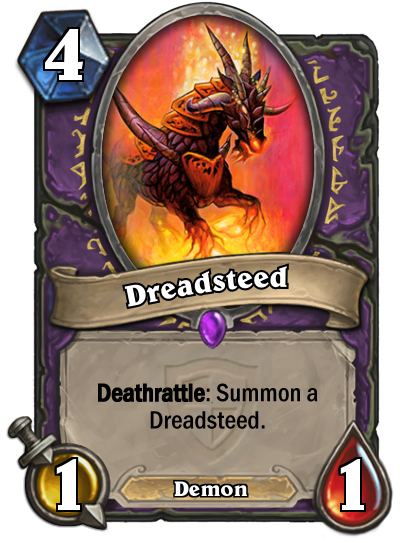 The appeal in Dreadsteed is that it can theoretically never go away, because its Deathrattle will simply summon another one. The trouble is that it's a staggering 4-mana play for what pretty much amounts to an Imp or a Whelp. Boosting its stats doesn't do any good, either, since its Deathrattle will simply bring it back as a 1/1 minion. And lord help you if this thing gets Silenced. Not all of the new Grand Tournament cards can be winners and this definitely stands to be one of the expansion's biggest losers, because the Warlock has far greater 4-mana minions at his disposal than this weakling. Here comes a unique minion in that it hits as hard as a bazooka to the face. The catch? It's not allowed to aim for the face. 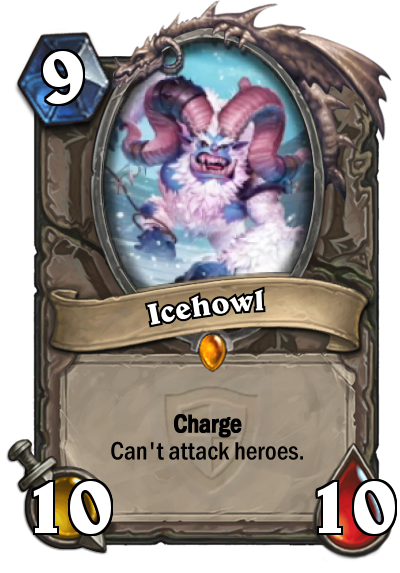 Icehowl is among the most powerful minions in the game and its Charge ability makes it all the more dangerous. However, it's not a finisher, because of its restriction that does not allow it to attack Heroes. That means its role is exclusively minion removal, particularly legends (like Kel'Thuzad and Ragnaros) and those pesky giants that inhabit so many Handlock decks. That is unless, of course, particularly clever players attempt to skirt the restriction by playing Mogor the Ogre and hoping for the best. Shaman players, in particular, may want to keep an eye on this guy. Not only does he help clear the opponent's side of the board, but following up any attack with Ancestral Healing can make it an insanely difficult Taunt minion to deal with. When Blizzard said it wasn't looking into nerfing Grim Patron anytime soon, nobody interpreted that as a suggestion to make Patron decks even stronger. And yet, here we are. Time to meet Sea Reaver, a sure-fire addition to Patron decks that stands to make those Warrior strategies more powerful than before. Sea Reaver's appeal is in its effect that kicks in when drawn from a player's hand. That means if any Grim Patrons with at least two health are on the board, they immediately multiply without any mana expense. This effect can also power up a number of Enrage minions, like Warbot, Amani Berserker, or Raging Worgen. It'll also trigger the effects for Armorsmith and Frothing Berseker. 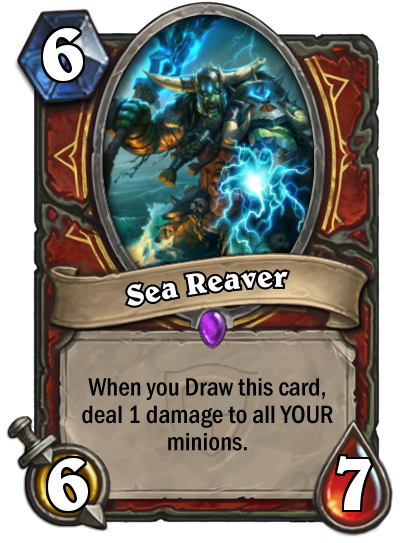 Sea Reaver's effect is crazy powerful and stands to be a huge boost to most Warrior decks, especially since it requires no mana. The kicker? For a 6-mana minion, a 6/7 line is pretty fantastic. That makes it a bear to remove, able to withstand most mid-level spells. Sea Reaver brings a lot to the table for the Warrior, making him one of this class's big winners from the Grand Tournament so far. One doesn't typically think of healing spells when one thinks of Shaman, but here's this class's most powerful healing card to date. Even on its own, restoring 7 Health for 3 mana is pretty nice. By comparison, the Paladin's Holy Light restores 6 Health for 2 mana and the Druid's Healing Touch restores 8 Health for 3 mana. 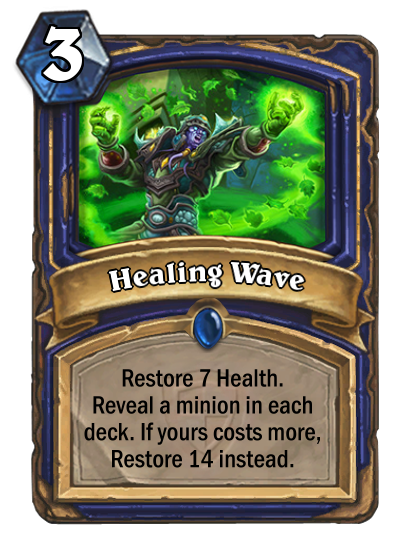 Add the jousting effect to it and Healing Wave can bring Shaman players back from the brink of defeat, especially from those aggravating Face Hunters. There aren't too many synergy possibilities for this one, since it's just a straightforward healing spell. Of course, it's a much-needed one for Shaman users, given the growing popularity of Face Hunter and Freeze Mage decks that concentrate on going for the jugular. If you absolutely must think of another practical way to utilize this card, that Icehowl mentioned earlier might need a pick-me-up at some point. Maybe use this to keep that in the fight? There's still much more to go with the reveals for Hearthstone's Grand Tournament expansion. Shacknews will continue its ongoing analysis of these new cards throughout the coming weeks, so stay tuned for more, as we continue our series.